The read receipts icons were designed to show the email status that was sent to your partner. Please refer to the key and the definitions below. The recipient has clicked one of the links in the email message and has viewed the quote in Emerge. Message was delivered to the email server. The recipient has opened the email message. 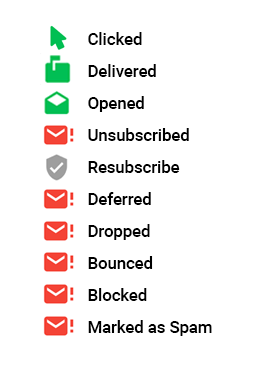 The recipient has unsubscribed from future emails. They will no longer receive any email notifications from Emerge. The recipient has re-subscribed to future emails. Yay! The email has been held in a temporary queue on the recipient's email server. Some larger organizations defer email messages with specific content to screen for spam. Call your Partner about your quote requests being deferred. Explain that the requests are coming from the email address requests@emergetms.com. Ask your Partner to speak with their IT team to allow these opportunities into their inbox. Our email system has prevented the email message from being sent. This will occur if the email has been marked as spam in the recipients inbox. Call your Partner to verify whether requests@emergetms.com emails have gone to spam. If the email is located in their spam folder, have your Partner mark this email as not spam. This will make sure their next request goes directly to their inbox. The email was not delivered to the recipient. This occurs in the event that the recipient's email is invalid. Call your Partner or their company to verify email address. Once you have the correct address, go into your account and delete old Partner contact. Create new Partner contact with the new information. For more details on adding a Partner, please see our article. The recipient has blocked or blacklisted Emerge emails. The recipient marks your email as spam. If you have any questions please feel free to reach out! We are more than happy to walk you through the process. Feel free to chat an Emerge Support Rep with any questions!